As great as it is to smoke premium cigars on the course, at the cabin, on the water or anywhere else, sometimes it's tough to keep them safe from the elements and in prime smoking condition. 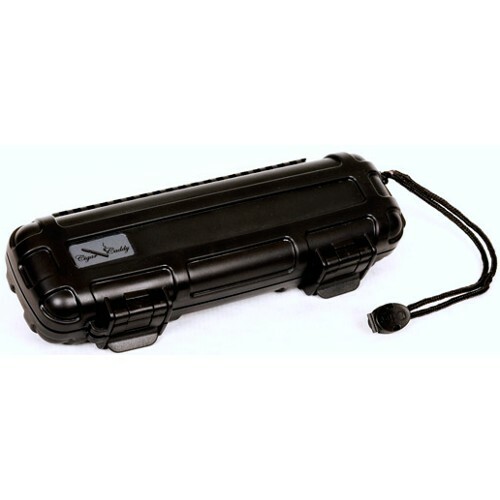 However this airtight, waterproof, and crushproof travel case is designed to keep up with any lifestyle, making it the perfect on-the-go case. Made by CigarCaddy from strong ABS plastic, it features foam cushioning on the inside to ensure the protection of your cigars anywhere you take them. As an added bonus the portable fits easily into a golf bag, briefcase, glove compartment or tackle box. This case is backed by a manufacturer's unconditional lifetime warranty. 8.80" x 3.10" x 1.70"